www.sapanasansar.com: ३ ईडियट्स् हरु ! An idiot is a mentally deficient , utterly foolish or senseless person. More humorous synonyms of the term include addlehead, blockhead, bonehead, deadhead, dimwit, dodo, dope, dummy. 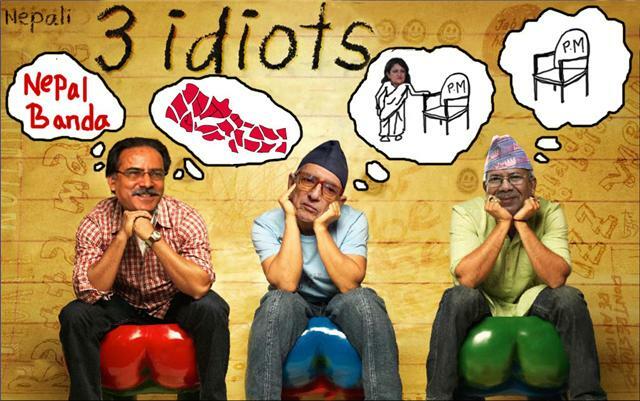 In the movie "Three Idiots" the three men weren't idiots in the literal meaning of it. Aamir khan was a visionary( a practical one)and the rest two were doing what was expected of them from their family. But the two right most men above in the picture are I feel the idiots in the real meaning of it. We can't deny the fact that they have contributed to our country's democracy and have fought their fights. But Today is a different issue altogether. I think government can't be run by people who have outdated ideas and who always think of pleasing India. I think we need a leader who will stand up for his ideas and sees that we don't always have to please our neighbours . For me personally I feel Mr. Pushpa Kamal Dahal's head should be placed in the middle in aamir khan's head because he has a vision for our country. For some people he might be unrealistic but friends I really believe he is a leader to look forward. ल ठ्याक्कै चित्तबुझ्यो हो मलाई त मैले यस्तै फोटो तलको लिन्कमा पनि भेटेथ्ये !